I Feel a Bit Guilty About Yesterday’s Post – Writer. Traveler. Tea Drinker. So after I totally dissed my students in yesterday’s post, I had my last class with one group of kids. We had a christmas party (I do it every year) and when class was almost over one student stood up and said they had a special gift for me. He brought up his backpack and dramatically took out pieces of the gift. First a bamboo brush, then a bottle of ink, then a porcelain ink plate and finally a pack of calligraphy paper. 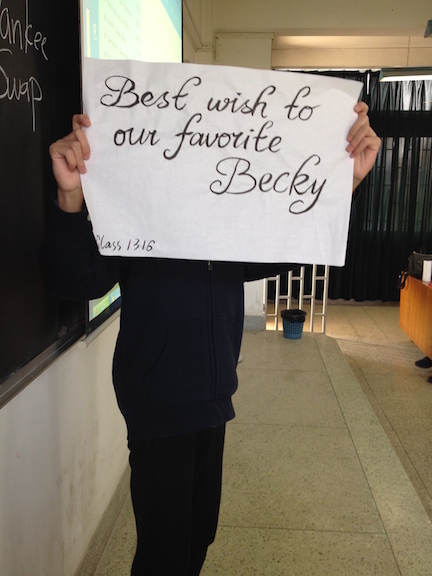 It was a very sweet gift (I like they were sharing Chinese culture with me) and I was touched. Now I’m feeling bad I was so harsh on them during the final exams and said bad things about them in yesterdays blog post. dude, I just went back and read yesterday’s post. you didn’t say anything bad at all. let it out, becky! don’t feel bad!